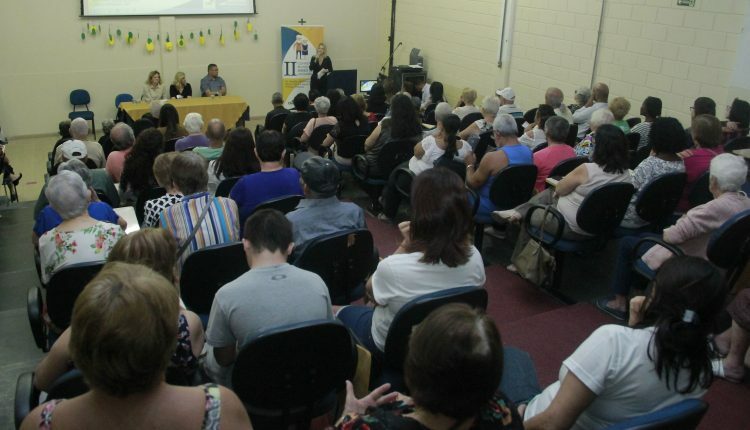 On March(29), the Social Assistance Secretariat of the Municipality of Jaguariúna and the Municipal Council for the Elderly (WCC) promoted the second edition of the Jaguariúna Municipal Elderly Conference. The auditorium of the University Center of Jaguariúna (UNIFAJ) received, in addition to the elderly, representatives of the public power and welfare agencies. During the conference, emotion and joy were not lacking. With the theme "The Challenges of Aging in the 21st Century and the Role of Public Policies", the event officially announced the inclusion of Jaguariúna in the Global Network of Cities and Communities that are Friendly to the Elderly. According to the secretary of Social Assistance, Andréa Dias Lizun, this result was obtained thanks to a series of actions from all sectors of the City. "We did a previous survey and identified all the needs and needs of the elderly. Based on this, we set up a plan of action that had excellent results. But, we can not stop. We will continue working, "she said. In addition, the ceremony featured a lecture by Prof. Dr. Elisandra Villela Gasparetto Sé and with the election of the delegates who will represent Jaguariúna at the State Conference. The chosen ones of the Civil Society will be Marilene Ferrari L. Alves (holder) and Maura Claudino (alternate). Maria Aparecida dos Santos Miguel (head) and Maria Regina Arendt (alternate) were selected as representatives of the Public Power. How collaboration worked: The Municipality, through the Department of Social Assistance and in partnership with the Municipal Council of the Elderly (WCC), held this Thursday, February 28, the "Pre-Conference of the Elderly of Jaguariúna." The works were carried out in Rua Cândido Bueno, without number - Serrinha neighborhood, headquarters of the Center for the Coexistence of the Elderly Roots of Life. The Pre-Conference of the Elderly of Jaguariúna was attended by representatives of CRAS (Social Assistance Reference Center) of Nassif, CRAS Cruzeiro do Sul, Ascending Life Group, CCI (Elderly Living Center) Roots of Life, Osmar Senior Citizens Center Carneiro and also the elderly who participate in sports programs and improve the quality of life promoted by the Municipal Youth, Sports and Leisure Secretariat (SEJEL), such as Viva Melhor and Proativ Mais. Details on older people's involvement: A rewarding morning" Lots of work and new knowledge and practices !!! This result was obtained thanks to a series of actions from all sectors of the City Hall. "We did a previous survey and identified all the needs and needs of the elderly. Based on this, we set up a plan of action that had excellent results. But, we can not stop. "Let's keep working." "A rewarding morning" Lots of work and new knowledge and practices !!! Requests for further advances in the areas of Health and Culture. es! Extensive dissemination in social networks, in the Councils of Rights Ex: Municipal Council of the Elderly, Forums and in the Centers of Reference of the Social Assistance. Disseminate among them (Elderly) the objective of the Conference, explaining that it would be the correct moment and opportunity of voice to the desires of the community of this segment. Filter the proposals presented by them, and adapting them to the reality and reach of the municipality, which will be presented at the appropriate time to the State of São Paulo via (State Conference of the Elderly).